This chapter aims to develop an ongoing research on digital travel videos, with an overall aim to offer methodological indications on how to analyze similar online multimodal and multimedia participatory situations. By addressing issues of popularity, response and appraisal, it examined meaning-making performed by text comments posted by YouTubers. Retrieved through the YouTube Comment Scraper software, comments have been inspected in terms of number, language, topic, appraisal, and linguistic features. Overall, instances show positive appraisal and are more focused on the videos, than on the depicted region, and their style epitomizes spontaneous and uncontrolled user-to-user communication within the digital participatory environment. More than for their content, comments seem to offer a relevant contribution to destination image formation, especially, through their presence and form, and from a connotative viewpoint. Alternative to formulaic and vertical tourism communication texts, they connote the destination as open and welcoming, as spontaneous and authentic. 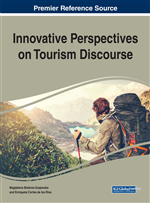 Unsurprisingly, latest research in tourism discourse is extensively examining digital communication (Granieri & Perri, 2009; Maci, 2012). Critical attention is being given to institutional and organizational online platforms (Hallett & Kaplan-Weinger, 2010; Manca, 2016), whereby official and non-official institutions, boards, agencies provide information on a given destination, with a more or less explicit promotional function. Editorial texts migrated to the web, such as, guides, journals, magazines, are also being scientifically researched (Godnic Vicic, 2011), alongside more personal travelogues (Cappelli, 2008; Dann, 2007). More recently, an observation of 2.0 participatory configuration of meaning and increasing attention to 3.0 augmented reality (Denti, forthcoming) can be envisaged within tourism discourse studies. Among the ‘superdiverse’ (Vertovec, 2007) range of ever-expanding and developing web genres, websites (Hallett & Kaplan-Weinger, 2010; Manca, 2012, 2016), blogs (Cappelli, 2008; Dann, 2007), digital journal articles (Godnic Vicic, 2011), online reviews (De Ascaniis & Gretzel, 2013), online videos (Francesconi, 2011), apps (Denti, forthcoming) are privileged objects of study. Against this backdrop, Youtube is yet neglected as a research site from the perspective of tourism discourse.